Topic-based units offer thorough input and practice of reading, writing, listening and speaking skills, with vocabulary and grammar presented in situations which exemplify their meaning and use. - Switch On to watch authentic TV clips and video podcasts - each unit of the course has video material that's fully integrated with topic and tasks. Power Up what teenagers know and get them sharing their ideas and knowledge of the world. Word XP, Grammar XP, Language XP tips and guidance take language skills to the next level. Speak Up, Listen Up, Write On sections teach new language in a personalised context helping students to engage, create and share. Exam tips give useful advice on how to develop and practise all skills for Cambridge English for Schools exams. Revision sections reinforce the vocabulary and grammar students have learnt. MyEnglishLab is an online platform that helps with vocabulary and grammar practice. It instantly grades student answers and gives them meaningful feedback, saving teachers time and energy. Insightful analytics give teachers the whole picture of each class' performance and help track individual student's performance. 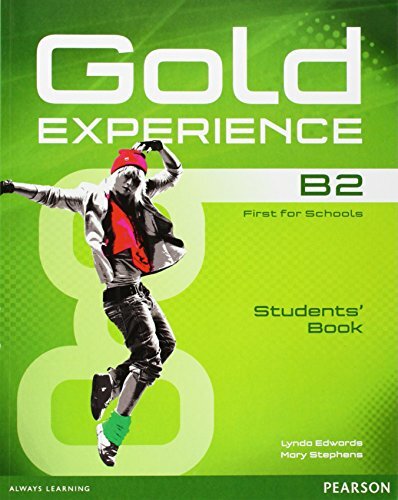 Has anyone got Gold Experience B2 Tests? Thanks in advance. @Caroll , I've added new link for SB under working FC/filecloud link. Try now. Many thanks - got it from the openload link (although my computer tried to block it because of malware). The filecloud one still didn't work. Anyway, have got now, so many thanks. One more thing. Next time when you ask something to be reuploaded in Langacademy.net-Reuploading-Requests AREA paste the link of thread/post that needs reuploading in the comment. It helps us, mods, immensely to start searching what you want.